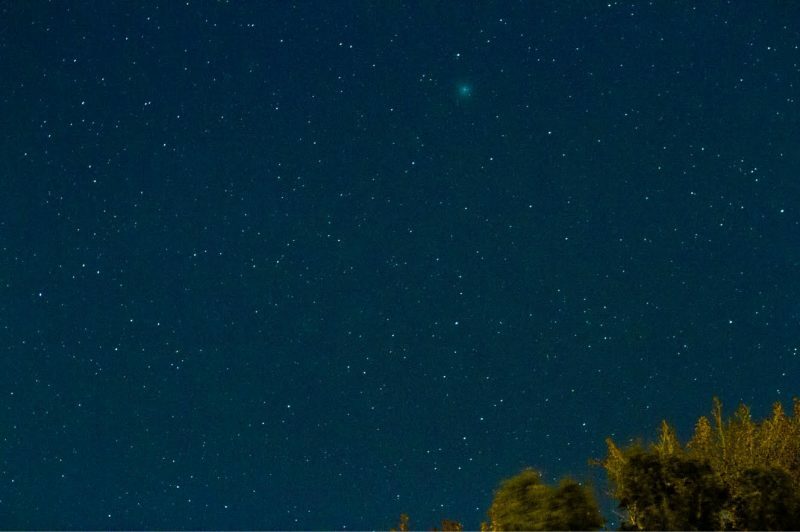 This year’s brightest comet, aptly dubbed “the Christmas Comet”, will fly across the night sky this week and dazzle stargazers across the world. The comet named “46P/Wirtanen” is about to pass relatively close to Earth – a mere 7.2 million miles away. Dubbed the “Christmas comet,” Comet 46P/Wirtanen will be making a close pass of Earth on December 16, according to NASA. It will be at its closest distance to Earth in over four centuries. But you don’t even have to wait until the 16th to get a glimpse of the Christmas comet, which is a member of the Jupiter family of comets. 46P/Wirtanen is bright enough to see with the naked eye above the eastern horizon all month long, and can be seen even better with a telescope or binoculars. And stargazers are in luck: The comet is not the only bright show gracing the sky this month. The Geminids, 2018’s best meteor shower, peak the night of December 13 (and morning of December 14). At its peak, close to 100 meteors per hour will streak across the sky in a brilliant light show. The Geminids are active every December, when Earth passes through a massive trail of dusty debris shed by a weird, rocky object named 3200 Phaethon. The dust and grit burn up when they run into Earth’s atmosphere in a flurry of “shooting stars,” NASA posted on its Watch the Skies blog.